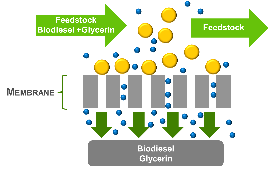 The Biodiesel Membrane Reactor utilizes a simultaneous reaction and membrane based separation process. The process is an unique combination of oil droplet separation, phase solubility and product separation all in one occurring at the traditional reaction temperatures. The reactor uses cross-flow filtration with micro-porous inorganic membranes to selectively remove biodiesel, methanol and glycerol during transesterification. When triglycerides are mixed and reacted with methanol they form oil droplets. The oil droplets are too large to pass through the membrane but the products which are soluble in the mobile phase can. The presence of two phases in the reactor ensures product quality by presenting a barrier which prevents the transport of unreacted oil into the product stream. The membrane also restricts passage of sterol glucosides. In its simplest form the membrane reactor comprises a pump and membrane modules in a continuous reactor loop. 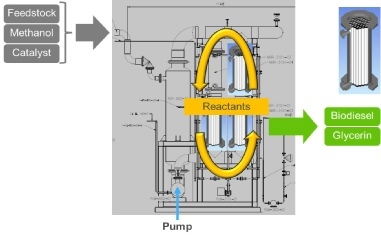 A continuous flow of reactants is feed into the reactor, the pump circulates the reaction mixture through the lumen of the membrane tubes and products permeate through the membrane wall. What is unique about BDR’s technology is that it impacts the chemistry of the reaction. Continually removing products from the reactor system shifts the equilibrium towards the final products reducing the amount of unreacted monoglycerides in the final product while utilizing significantly lower catalyst concentrations.